VietNamNet Bridge – Vietnamese track-and-field and gymnastics teams are facing some problems in the United Kingdom (UK), right before the London Olympics. 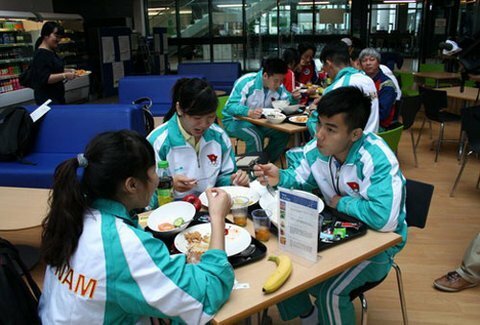 A meal of Vietnamese athletes in the UK. The coaching boards of the two teams said that the Bradford College’s facilities in West Yorkshire are not good enough for drilling. The gymnastics team lacked training tools while the track-and-field team did not have training grounds. To deal with this difficulty, the gymnastics team moved to Leeds, 35km from the Bradford College, while the athletics team moved to a university which is 25km from the Bradford College. The two teams have only ten days of drilling before the Olympics, so their training plans have been affected by this unexpected situation. However, the situation has been stabilized. Other difficulties for Vietnamese athletes in the UK include cold weather and strange food. They eat at schools’ canteens, where they are supplied with potato chips, dried fish, salad, soup, rice and fruit. “Temporarily I have some difficulties with food and the timetable here, but I think I will gradually fit with it,” said gymnast Ngan Thuong. Ronnie Todd, who is in charge of the Olympic project at the Bradford College, said he was sorry about problems for Vietnamese athletes but he confirmed that Vietnamese athletes would be offered with the best conditions for training. He added that training tools in Leeds are similar to those at the London Olympics and it is the most important thing.